Choosing new kitchen taps can be challenging as well as confusing. With several different types of kitchen taps available in the market, your choices are endless. However, when it comes to choosing kitchen taps in Perth, they need to suit the style of your space, look good and offer you the functionality you need. With this in mind, today we look at a brief, but a handy guide on how to choose the right kitchen tap. So, continue reading this post, and by the time you’re done, you’ll know just what to look. First of all, you should know that kitchen taps come in various types. By type, I don’t mean the design and form of a tap, but also the way in which it functions. Some of the most common types of kitchen taps include single lever taps, mixer taps, retractable or pull-out taps and wall-mounted taps. Single lever taps allow you to control both the flow as well as the temperature of water using a single lever. Such taps can also be classed as mixer taps, and they come in a range of designs and styles, including high spout designs. Single lever taps with a high spout are a great choice for kitchens that have a small sink. Alpine Building Products offer some excellent single lever kitchen taps in Perth for you to consider. The Fiona Sink Mixer, Project Sink Mixer, Round Kitchen Mixer and Cube Kitchen Mixer are all great choices for your kitchen. Retractable taps can be pulled out from the housing unit which is why they are also known as pull-out taps. They are very functional as you are not confined to a small area of water flow. This makes them best suited for larger sinks. Alpine Building Products has some great retractable taps in its range. Take a look at the Fiona Spring Sink Mixer and the Kitchen Mixer and Sprayer Unit. You won’t go wrong in choosing either of these taps. Wall-mounted taps are taps that are fixed onto the wall above the sink. Such taps are available both as a one unit mixer tap and also as a set comprising of the faucet and two turn assemblies. Should you be in the market for high-quality wall-mounted taps in Perth, look no further than the Alpine Building Products’ range. The Fiona 1/4 Turn Wall/Spa/Sink Set, Cube 1/4 Turn Wall/Spa/Sink Set and the Square Wall/Spa/Sink are examples of some of the great wall-mounted taps in our range. The type of kitchen taps you choose should depend on your kitchen space. 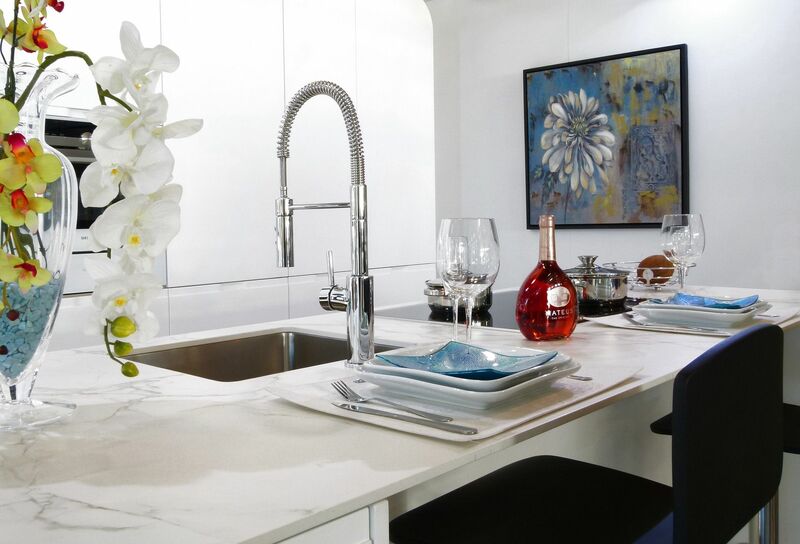 Consider the style and design of your kitchen and the space available around the sink. Also think about your cooking, cleaning and washing habits. It always makes sense to choose by functionality first and style later. Make sure that you choose kitchen taps in Perth that offer you the functionality you need. For instance, if you have a small sink, there’s no point going with a retractable tap. A high spout single lever tap is a much better option for you. Given that taps are available in different designs and styles, once you choose the type of tap, you’re sure to find plenty of attractive models. Apart from your considerations regarding the type of tap you need, you also need to make some additional considerations. Make sure that you purchase a high-quality kitchen tap from reputed manufacturers. Taps are heavily used in every kitchen, so you’ll want a tap that will be durable and well manufactured. Also, make sure to choose a kitchen tap that features high water efficiency. Check the WELS rating of a tap model to find out if it is efficient or not. Before you purchase kitchen taps in Perth, you must consider a few things. Kitchen taps are available in many types including single lever taps, retractable taps and wall-mounted taps. Each type of tap offers different functionality. Consider your space and how you will use your tap to choose the right tap type. Also, check the WELS rating for water efficiency of a tap before making a purchase. And, when it comes time to purchase a kitchen tap in Perth, look for a tap by Alpine Building Products. Find your nearest Alpine Building Products retailer to purchase any of the tapware mentioned in this article.